For Vegas Oddsmakers, Home Team's Fairy Tale Season Becomes A Frightfest : The Two-Way The odds of the Vegas Golden Knights winning the Stanley Cup hovered as high as 500-to-1 last fall. Now, the team has made the final in its first season — and some bettors stand to win big. 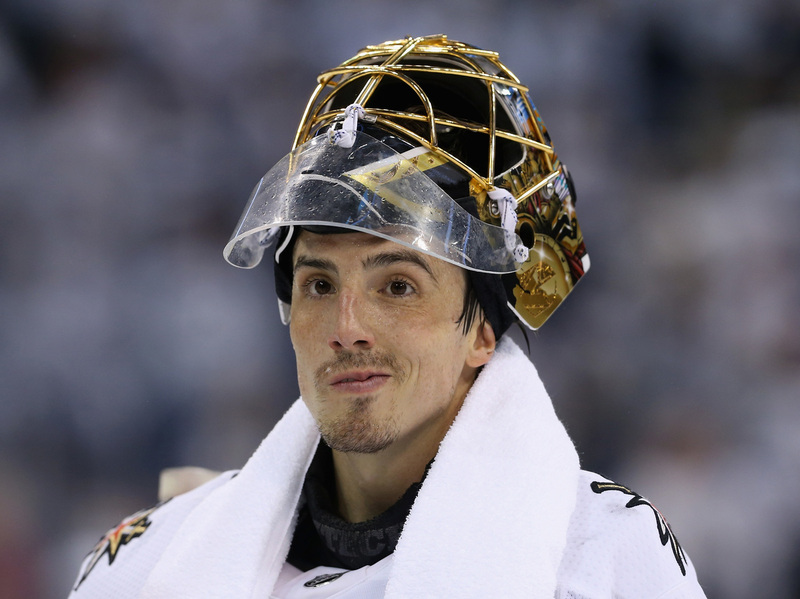 Marc-Andre Fleury, winner of multiple Stanley Cups with the Pittsburgh Penguins, had been cast off to Vegas when a younger player took his spot as starting goalie. Now in goal for the Golden Knights, he's four wins away from adding his name yet again to the Cup. "How good can they be? Spoiler alert: Not Very Good." That was one hockey writer's analysis of the Vegas Golden Knights back in July, not long after the expansion draft in which the brand-new franchise picked its roster from the dregs of other NHL teams. In other words, roughly 10 months before this Not Very Good ™ team (spoiler alert!) made the Stanley Cup final on Sunday. But we don't mean to single out one unfortunate prediction here. In the days immediately following the draft, the unfortunate predictions came hot and heavy. There were so many, in fact, here are some tweets to save us all a little time. Remember when we all thought the Golden Knights were going to be better than expected? Yeah, nope. Wow the Golden Knights are gonna be so, so bad. Now, there's no shame in getting the future wrong. Goodness knows your humble reporter would have, if asked for an opinion on the Golden Knights at the time. The point is just that, with some rare exceptions, virtually no one was bullish on this team coming into the season. And frankly, they would have been a little mad if they were: Before the Golden Knights — or, as they are sometimes known, the #GoldenMisfits — the past four expansion teams to join the NHL all finished comfortably seated in the basement of their division. Made sense, then, that the odds of Vegas winning the Cup at the start of the season hovered around 200-to-1. Jeff Sherman, an oddsmaker at Westgate, noted that at one point his Las Vegas casino had the team's odds at 500-to-1. Of course, those odds don't make a whole lot of sense months later, when seen in the harsh light of May — and when, with Vegas four wins away from the Cup, a bettor's $60 last year stands a decent chance of turning into $30,000 next week. Some bets reportedly stand to pay out at $120,000. What was once an act of faith (or madness) by an overeager fan could now be a nice car paid in cash. Or, if the bettor happens to be a fan of the Tampa Bay Lightning or the Washington Capitals, both of which still have the chance to beat Vegas for the Cup, that preseason Hail Mary ticket could now seem like a divinely ordained test of loyalty. Either way, Forbes points out that while casinos stand the chance of staggering losses, perhaps we shouldn't be weeping too much for their plight. "Hockey betting has long been at the bottom of the barrel for major sports in Nevada. This year, however, hockey betting is up 35% or so across the board," Jim Murphy of sportsbettingexperts.com told the publication. "The Golden Knights have also created a lot more traffic in casinos which not only helps betting revenue in other sports but in other areas of casino operations—slot play, food and beverage."